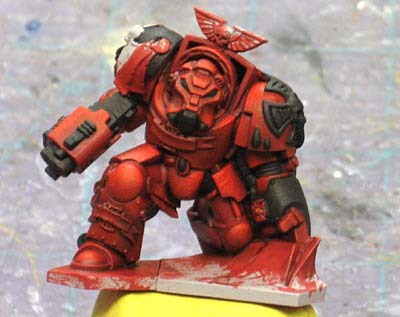 With Blood Angles here to stay, I figured I would share my process for painting red. It can be a difficult color to master for some folks and this might help show that it can be easy to do with relatively little work. There are lots of different ways to paint red... each with its own merits. Ultimately, you've got to go with what you like that gives you the results you want in the time you're willing to spend on painting. I will say that I'm not using all GW colors in this process. I tend to use whatever works and looks best to me, so I end up mixing and matching colors and paints from different ranges. The first step is priming this guy light grey. Black is too dark for me when I'm working with middle of the road colors and white is too bright. As long as when you prime, you understand the effect your primer color will have on your end result, you should be fine. The basecoat is done with Moroccan Red. It's fairly opaque and usually requires just one coat with some touch ups in places I missed the first time. After that, it's a series of washes to create the shadows. The highlights are done with Bright Red. The reason this color works so well is because it's a semi-transparent color. That means it will take two or three passes to get the actual color on the model. This allows me to blend the highlights into the model without any problems. I just start painting where I want the highlight to be the strongest and continue to feather the paint out from that. Sometimes I'll add just a tiny bit of water when I'm blending it out so the transition is super smooth. And here he is with the black areas blocked out. This gives you a better feel for how the highlights stand out on the model since it can look a little dark overall with no other parts painted for contrast. And an optional step. WHen it came time to paint the Chaplain model, I decided to try adding a thin line highlight to the edges of his armour with the Terra Cotta color. I only did it in a few key places (tops of his shoulder pads, his left knee and his helmet) to add some emphasis on key areas. I've always struggled with highlighting red. It always seemed like the highlight came out too pink or too orange and never looked "right." By using a light orangish-brown color (instead of just orange) , I can get just the right highlight color and not have it look out of place. The best instant advice I can give for painting red is not to try to do it all at once. It is tempting to try to lather it on and get that rich red to cover all in one swipe. With red, you need to apply it in thin layers over time. But even more importantly, is once you have applied a brush stroke, DO NOT go back over it with 2nd and 3rd strokes as it dries. Use one confident stroke and drag the color across the armor plate. Going back will just create uneven brush strokes in the drying paint. This will also allow control. Hopefully this shows you guys that it is easy enough to get your Blood Angels or successor chapter painted up and you don't need to be afraid of "red" when it comes to painting. 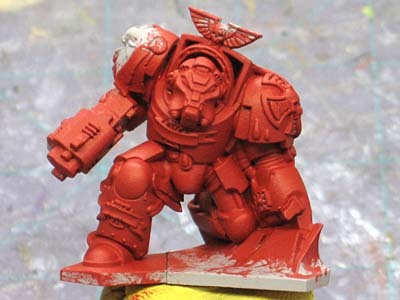 I'd like to see some finished Blood Angel armies out there in a few months and not just people telling me "they can't paint red." If you've made it to the end, go back to the top and look at the second pic... While it's not "red," I painted the tread on the bottom of the terminator's boot. How's that for attention to detail? Looks really good, and very simple to achieve as well. Yellow can't be that hard is it? No its really easy actually, although It gets REALLY boring...and my results looked like wartorn marines. Which is great considering I went for that look, but I always wanted a couple of clean units. I've always heard yellow is a nightmare though. No? I like this approach better than GW's. The wash tones the orange down nicely. I hope to have some pics up soon if work will allow me some free time. Nice tutorial, even though the colors are alien to me. 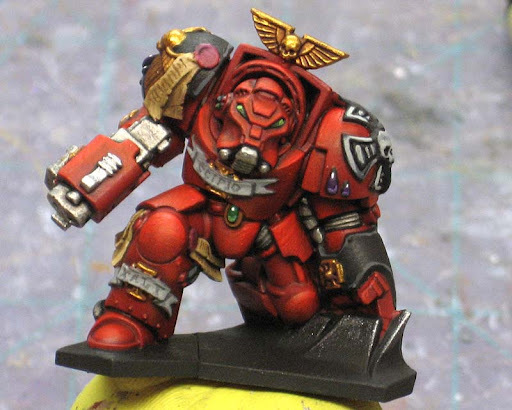 I'll make a tutorial on painting Blood Angels with Plaid Folkart paints and GW washes one day. My style is quite similar to yours but Instead of devlan mud I just use watered down Black paint to blackline the cracks. I like your reds a lot, but I think the shades/cracks could use some stronger contrast, a darker color. Maybe use a mix of Devlan Mud and Badab Black instead? Charles: You could change out the colors to whatever you want and I bet it would still work. If you spray the basecoat, that shouldn't be any different than brushing it on really. tahrikmili: I go back with Badab Black and hit key recessed areas for some greater contrast, but for consistency sake, I haven't really worked on that aspect with these models. It does make a difference though in making your shadows realy sink back. I'm still learning how to use the darkest shadows and brightest highlights in certain areas to draw attention to specific parts of a model. I am going to give this a shot with my new CSMs this weekend. They're purple, but it should be the same concept. What I am really digging is your wash techniques to create contrasts. 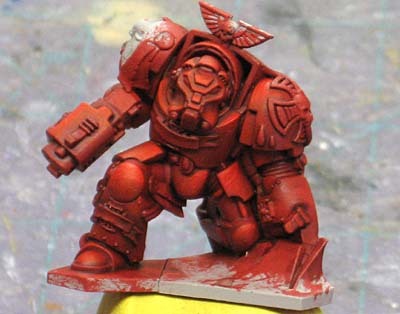 Question though, do you black out all of your non red after you base coat ( 7th "big" picture down) or is that just what you want for metallics and other "hard" surfaces? Ghengis Vaughn: I only black out what will be the metallics and black areas in the end. Gold areas are blocked out with brown and other areas are blocked out with appropriate colors. Thanks, Ron. This is a very timely article, as I'm working on a project involving red. 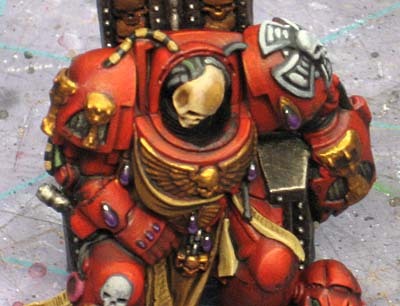 I've been reading up on how Master Darksoul painted the red in his Skulltaker. Between this and that article, there's much inspiration. Start with a base coat of Red Gore over White primer. Wash with an even mix of Devlan Mud, Badab Black and Baal Red. When dry, wash with thinned Devlan Mud. Higlight with a mix of Red Gore adding Dwarf Flesh until it's 50%-50%. Last optional higlights with a mix of Red Gore, Dwarf Flesh and Bleached Bone. Thinned down coats of Baal Red help get the transitions smooth. 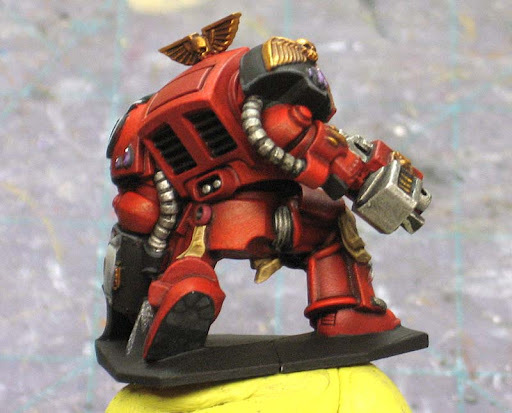 If you paint red it is worth looking for tutorials and tips for Khador from WARMACHINE. I always though that there are many that can give their red armor a cool look. Also worth looking into their forums (privateer press) for painting tips. Those terminators look great, I'll have to look up the paints you used. Excellent work, they look sweet. Another tip I have is to use a brown base coat, it works if left in the really dark shaded areas and looks like red in shadow. inrepose: You know, I never would have thought to use brown. I've used it when painting gold models, but wouldn't have theought about it for brown. been painting BA for years and this is by far one of my favorite overall "look." Not a big fan of delta ceramcoat but I gotta give it up to you for making them work. Cande2105: Thanks. I've since moved over to mechrite Red since it is a bit more opaque... but the two base colors are almost exact matches. That and I'm a bit more controlled with my washes too. Simply awesome. And I like how you used the cheap paints, I have several instock and used them awhile ago on some older Fantasy armies, well done. relic: Thanks! The cheap paints come in handy more than you know. I use a few GW paints (the standard ones and some Foundations), but the majority of my stuff is "cheap" paint. 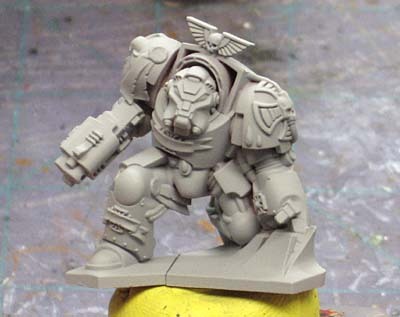 I cant get those cheap paints in the uk, what would be the best gw/army painter/reaper/Vallejo paints to use instead? Pootank: Hmmm... that's a tough one since I don't know the direct GW match for the paints. 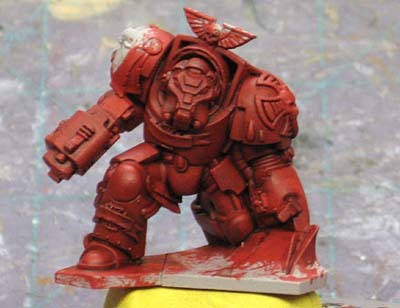 I've had good luck with a light grey primer, GW Mechrite red for the base color and then a bright red color (I don't know the GW equivalent) as the highlight. You can shade with any color. Try staying away from Devlan Mud and Badab Black to keep your shadow colors from turning flat. Thanks! Red is one of those colors you really do need to try a few approaches to until you find the one way you like best. There are so many subtle ways to do it... each one creating a slightly different end result. How do we achieve this now that Baal red is gawn? I tried emulating with carroburg crimson an bloodletter red glaze and the results are not nearly as warm. The higher level of magenta throws off the effect quite badly. Anon: Good question. I'm not sure what wash would work best now. Getting that "just right" shade of red can be tough and often a long search to find it. Wow, that is a tough one. I'm considering mixing a red and a brown to the right hue and then watering it down, maybe 4-1 or 6-1 to get the hue and thickness right. I've tried to find the old supplier (no joy, insufficient data :( ), and have started stocking up on all the Baal red I can get. Worst comes to the worst, I'll get it chemically profiled at Stanford. It looks like vg red ink isn't the same, and I've een unable to replicate using unmixed colors sofar. Any ideas would be welcome XD . Will report back if I make any progress.